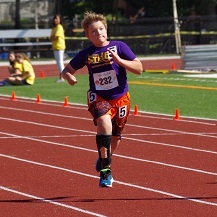 The following information is based on our family’s direct experience with able-bodied and disability sports. 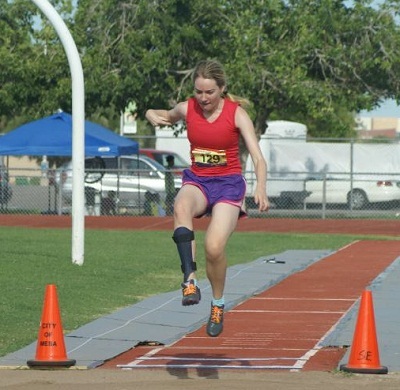 Though no one in our family is a professional athlete, our daughter (age 14, with left hemiplegia and epilepsy) was the 2001 National CP7 Champion in a number of disability track and field events. She also plays “regular” tennis at the tournament level, earning an official USTA ranking of 318 in the state of Florida against able-bodied 14 year old opponents. In addition, her father and I have both been involved in sports and athletics all of our lives as collegiate athletes, children’s coaches, fitness instructors, and recreational/amateur athletes in a number of sports. 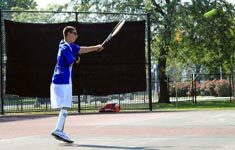 Tennis offers many benefits to children and adults with brain injuries compared to other sports for both ambulatory participants and wheel-chair users. Tennis is a non-contact sport. There is little risk of being hit, tripped, pushed down, or trampled. Tennis is a year-round, life-long sport that is played worldwide at all levels. Once you learn, you can play tennis for the rest of your life. Anyone can learn and play tennis, regardless of gender, age, fitness, or ability. Tennis is a social sport, yet you do not need an entire team of people to play. If you can play tennis, you will always have a way to find and make friends. CP-participants and able-bodied participants of similar playing ability can play and have fun together without modifications, regardless of gender and age. Ambulatory CP-beginners, and in some cases wheel-chair beginners, can start with able-bodied beginners in “regular” group lessons. As movement is limited for all participants at the beginner level, CP-beginners are not at a significant disadvantage at the start. 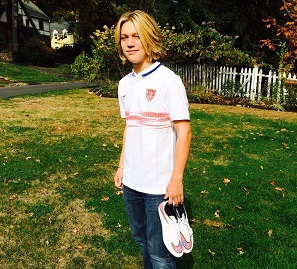 As all participants progress at their own rate, CP-players can take the time they need to develop their skills, without fear that there will be no one to play with. 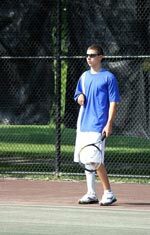 Organized tennis is available for all levels of playing ability for ambulatory players and wheelchair players. The game of “Doubles” lends itself to participants that are less mobile. 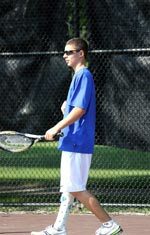 Tennis professionals can readily integrate CP-players into most lessons, drills, and clinics with able-bodied players of all levels by merely adjusting the feed of the ball. Tennis builds balance, coordination, agility, fitness, body awareness, spatial awareness, concentration, and focus within a framework of fun and social interaction. Learning to keep score teaches abstract math skills and builds short-term memory. Tennis strategy teaches split second decision-making and strategic thinking. To get your child started, try public recreational programs or classes offered by tennis centers or country clubs. For very young children, try to find “kiddie” group lessons designed to build basic skills within a framework of fun. Kiddie lessons should be limited to about 6-8 children per group, run about 30 minutes, and taught by an experienced pro that knows how to make learning fun. The following will give you some background on the type of tennis training my daughter (now age 14, LH, seizures) has received over the years. Please note that she has never attended any adaptive sports programs. She has always participated in programs for “regular” kids. May daughter started in tennis at about age 4 by attending an 8-week “kiddie” tennis program offered by our local public tennis facility. These classes were 30 minutes long. As kids at this age (ages 4-6) are not coordinated enough to actually “play tennis”, kiddie tennis involves fun drills/games designed to teach hand-eye coordination, basic movement, and have the children associate tennis with fun. At this age, I also took her to the tennis court, fed her balls, and let her whack away at them. After 2 kiddie sessions, I enrolled her in an on-going children’s tennis program that ran for 2 hours, 2 afternoons a week at a local Country club. She continued with these classes through the school year and also attended tennis day camp every summer until the age of 10. During this time, she kept up with the able-bodied children without accommodation and progressed along with her age group—despite sometimes wearing an AFO. At age 10, she had to stop tennis for about a year due to heel cord surgery. At age 11, following rehab from surgery, she started in a pre-tournament level tennis program that ran 2 hours per day, 3 days a week. Since then, she has progressed into full tournament level training. She now trains 3-4 hours per day, 5 days a week for tennis and track/field, plus plays United States Tennis Association (USTA) junior tennis tournaments 2-3 weekends per month, and is a USTA ranked Florida junior. My daughter continues to progress as a player. She is hitting all the tennis development milestones, but on a lagged basis compared to top ranked juniors players due to heel cord surgery, need for remedial footwork, weaker left leg, and need to develop a one handed backhand. (A one-handed backhand takes significantly longer to develop than the two-handed version and cannot be developed until about the age of 12 when the player becomes big enough to hit with only one hand.) She has now reached a point where she is competitive against most able-bodied juniors her age, but is at a disadvantage when playing against the most highly ranked tournament level juniors. At this point, we believe she is currently capable enough to be a competing member of a high school tennis team. And, based on her continuing progress, we believe that it is very possible that she could play college level tennis and, perhaps, become a teaching pro. As my daughter has almost no use of her left hand, she holds both the ball and the racquet in her right hand to serve. She tosses the ball with her right hand, while at the same time she holding her racquet loosely in her right hand. As the ball travels through the air, she sets her grip and then hits the ball like a regular serve. At first, when she was little, her ball toss went everywhere. At that point, I thought she would be lucky to eventually just dink the ball over the net. But she kept at it. It really didn’t take that long for her to start controlling the toss and hitting the ball in the service court. As her hand grew and as she practiced more, everything got even easier. She now can hit her serve flat or with spin. Her serve is competitive with many other tournament level juniors her age. One of her serves was recently clocked at 89 miles per hour. To get started with one handed serving, have your child stand on the service line holding his/her racquet up above their head. Then, you stand on the other side of the net and toss the ball right to the racquet. Instruct your child can try to hit the ball back over the net. After your child gets the feel of hitting from this position, have him/her try to toss the ball up and hit it. Don’t worry about whether the toss is too high or low or where the ball lands. Just have your child try to toss and make contact. Most importantly, make it fun. Control will come with practice. 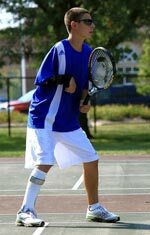 Even if your child is older, I believe that most Children with cerebral palsy can start in a regular beginner tennis class. Tennis beginners at any age do not start out “playing tennis”. They start with very simple drills that build coordination. Running is kept to a minimum in beginner tennis because beginners haven’t learned to hit the ball while standing still, let alone while running. 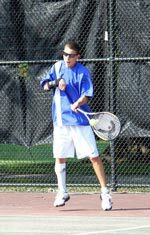 For more information on tennis from the United States Tennis Association, go to www.usta.com.